You must be logged in to access your collection and want list. Let us find the models you are looking for! We know there are many models that you wish you had in your collection...but searching for them is time consuming and often you miss your chance to make the purchase. $ changing that here at DiecastModelAircraft! Search for models and let our free automated system email you when they are available! Let us do the difficult work while you sit back and watch those missing models appear in your collection! 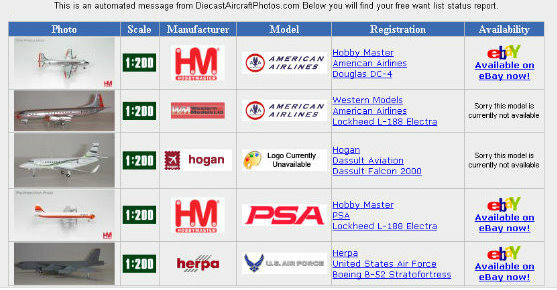 Search for models, click the "Add to my Wantlist"
Let our system email you automatically when the model is available!